Overlooking the Picton Harbour in the heart of Prince Edward County, this 3 bedroom vacation home is a perfect blend of modern convenience with historic charm. 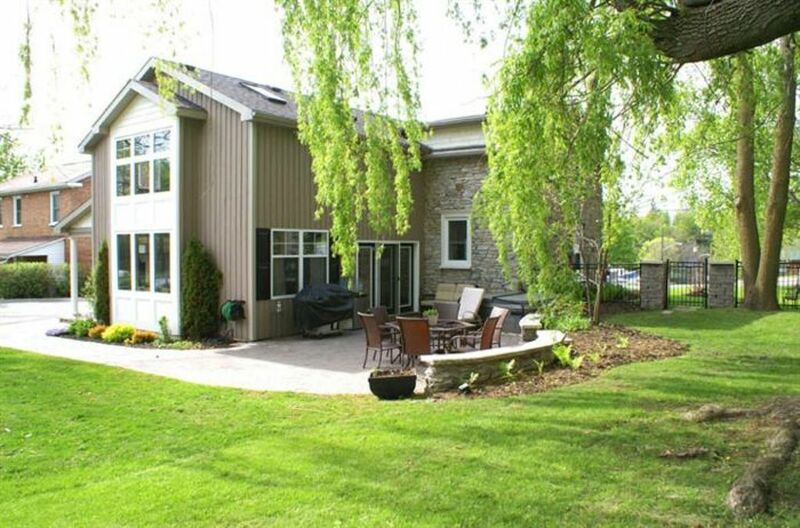 Tour the County wineries, visit the Sandbanks Provincial Park beaches, sample the regional cuisine and peruse the local shops from this centrally located limestone house. For your convenience, a beach pass is provided with your rental. Return home to upscale comfort & convenience set on a one acre landscaped lot with stone patios, lush gardens, hot tub and manicured lawn. This limestone trapezoid shaped home was built in 1847 and has been renovated to preserve the history of the home while providing modern custom features. The kitchen features new espresso cabinetry, stainless steel appliances, tile floors and bright windows overlooking the harbour. The great room features a flat screen TV viewing area and spacious dining area. The large windows overlook the landscaped yard, and there is access to both the side porch and back yard stone patio complete with charcoal BBQ and 5 person hot tub. The front walkway leads to the Picton Harbor where you can enjoy a stroll on the docks, go fishing, or moor your boat. A couple of blocks further and you will find downtown Picton with its many cafes, restaurants, shops, galleries, and theatre.If you're looking for adventure, spend the day at the beach or one of the local spas, tour the wineries, shop and browse in the boutiques, artisan and antique shops, dine out at a fine restaurant or pub, play a round of golf, tour the County on bicycle, or check out the local farm markets. CLEANING & LINENS ARE INCLUDED. Features Available: WiFi, TV/DVD/satellite, laundry, dishwasher, hot tub. High Season (Jun 29 - Aug 30): WEEKLY RENTALS ONLY WITH SATURDAY CHECK-IN/CHECK-OUT. Low Season: 2 night min; 3 night min for long weekends. We require the names of all occupants and the ages of any children in compliance with a local by-law. Accommodates 9 persons - max 6 adults. Families, couples & girlfriends preferred. Check-in 4:00 pm; Check-out 11:00 am. High Season (Jul & Aug): WEEKLY rentals only with Saturday check-in/check-out. Rental Agreement: Upon booking, guests are given up to one week to review and accept a rental agreement issued by our agency. Payment Options: We accept Visa, MasterCard, e-transfers, and cheques. Please note that there may be an additional payment for optional services and security deposits.. Guests must be at least 25 years of age to make a booking. La maison est très belle, bien située dans le village et il y a de l'espace pour toute la famille. Les points forts sont la salle de lavage et le beau terrain. Quelques détails sont à améliorer : le lave-vaisselle coule, il manque de bonnes poêles, l'air climatisé ne monte pas en haut vers les chambres, un des lits est trèèès mou... On a, par contre, eu une réponse rapidement lorsque l'on a posé des questions aux gens qui s'occupaient de l'entretien. Ce qui nous a dérangé le plus de cette location: les différents sites internet... home away, vrbo, county Holiday home, et j'en passe... Tout le monde prend ses "frais" et certains deux fois, donc soyez vigilant sur votre carte de crédit, surtout si les proprio ne répondent pas en 24h. Ils ont fait des erreurs dans nos dates de réservation et ils se renvoient la balle. Bref, je reviendrai à Picton mais peut-être avec airbnb? The property is accurate as described and the location is ideal; an easy drive to wineries and beaches. There is also the advantage of having restaurants within walking distance; Portobellos is especially close and quite good though I would recommend making a reservation. The provided park pass is a lovely added touch. The property is very clean and well maintained and we would not hesitate to recommend Owen House to friends and family. I would suggest providing sheets (we only used the Master bedroom) of a little higher quality. Also, the Picton area can get quite hot and the master bedroom does not seem to be vented to the house's air conditioning and there was no fan provided; so that room became quite uncomfortable at night. I would suggest providing a fan. Overall, it's a lovely house.